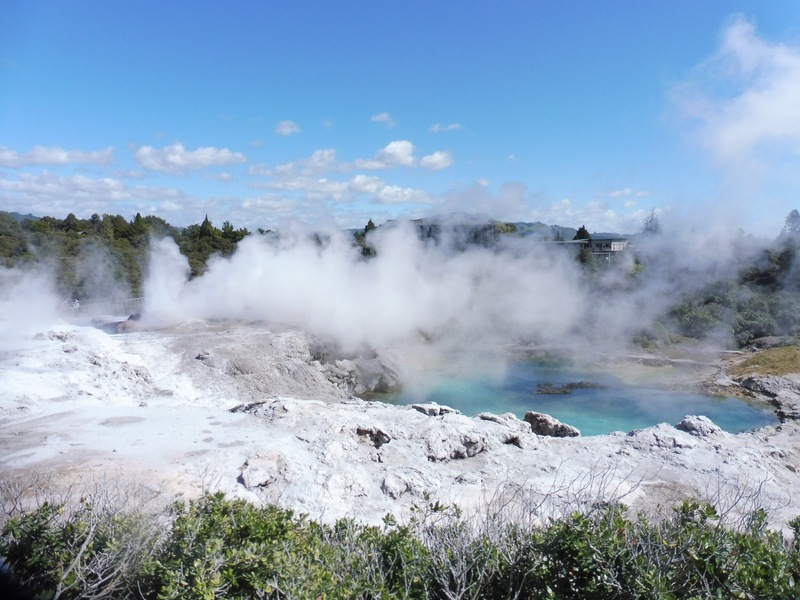 Next stop on the Kiwi Experience bus is Rotorua, home to the Geysers. Early on we made a stop for another walk, but by the time I’d put my trainers on and went to get off the bus, it was locked! Whoops! Must make sure I put my trainers on early next time! I wasn’t totally heartbroken as it was pouring rain so at least I was nice and dry when they all came back soaked through. After that it was more of the napping whilst driving combo before we arrived at Hobbiton. 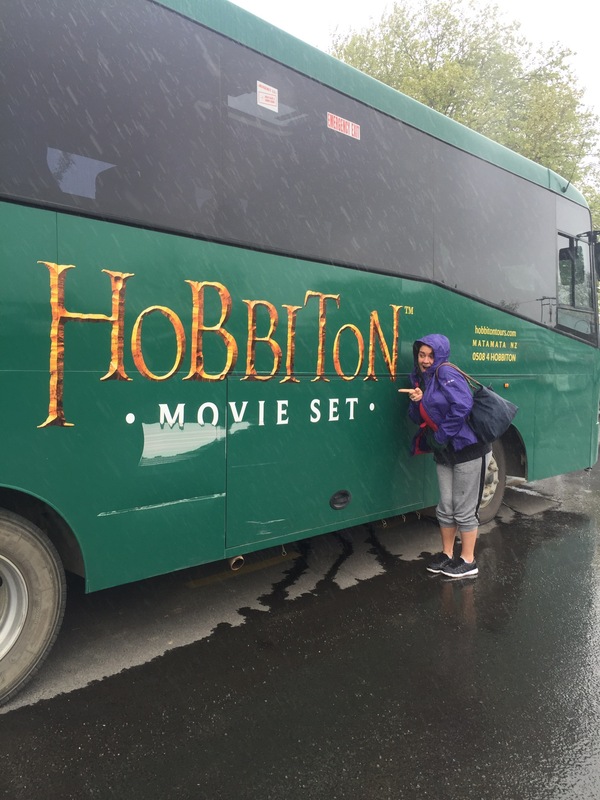 Much to the shock of many fellow travellers, Steph and I have never seen Lord of the Rings or The Hobbit so had no interest in this activity! Especially for the hefty price of $75. 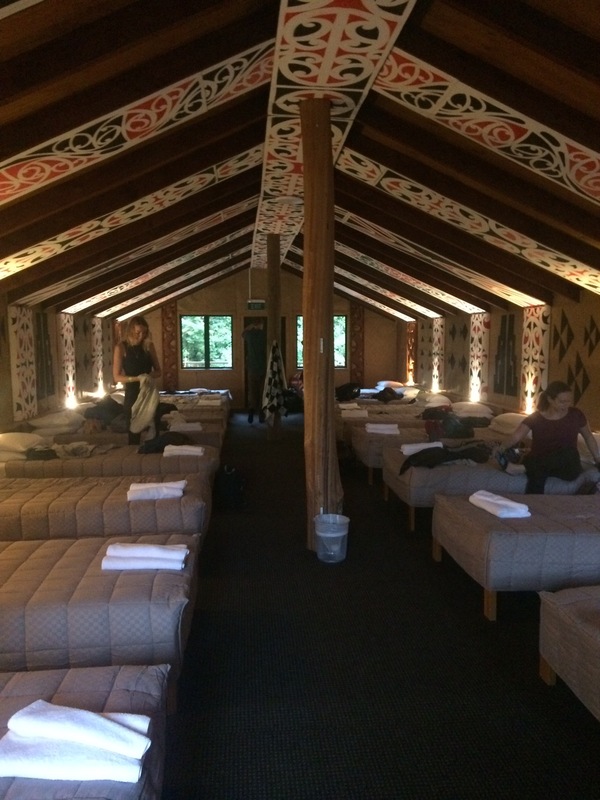 Instead we headed straight into Rotorua, to check in for our evening activity, an overnight stay at the Tamaki Maori village. 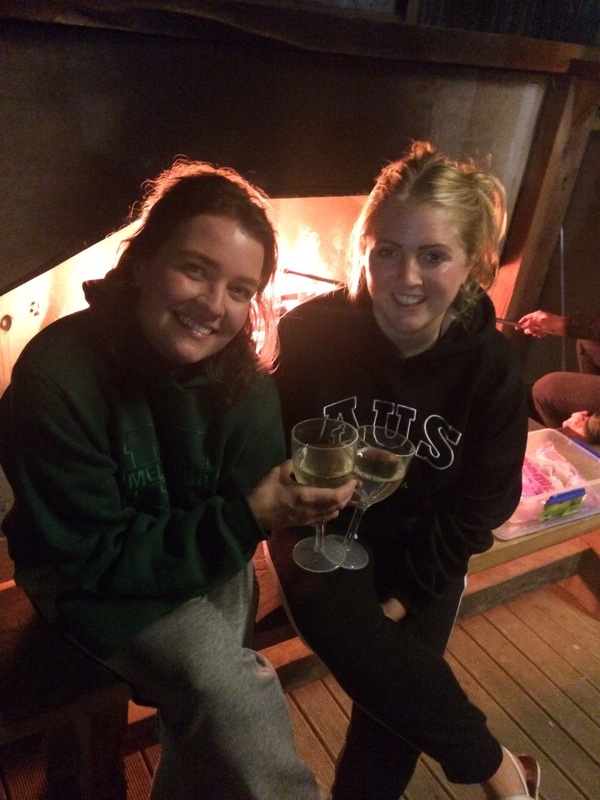 This is one of the activities we really wanted to do as everyone we know that had already done it raved about it. We arrived to be greeted by a man and a woman who sang to us before serving us with a delicious afternoon tea. It was then our turn, our elected chief had to thank them for our hospitality and then lead us in our tribe song (we went for We Will Rock You). After that we formed a little choir to learn a Maori song with some moves to perform later in the evening. Not sure how great our pronunciation was! 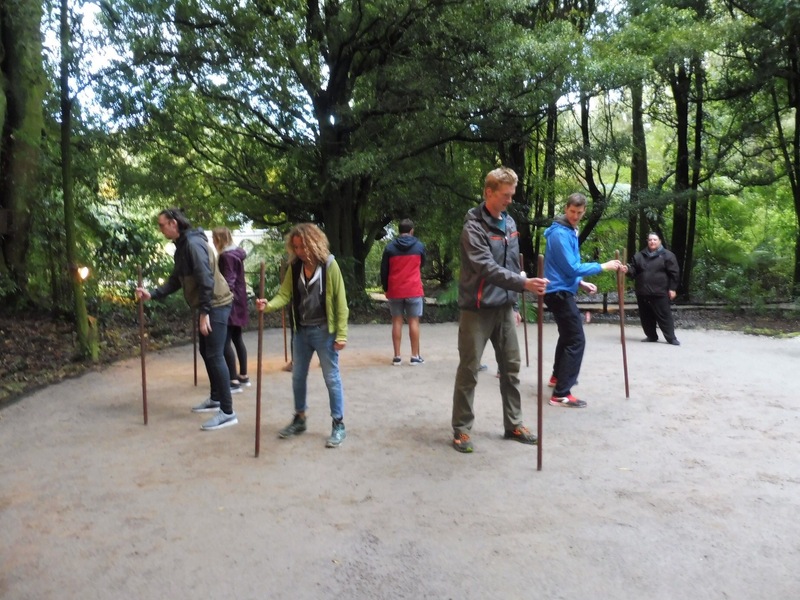 Once our Maori guides were happy that we’d got the song down, they lead us into the forest for some tradition Maori games involving long wooden sticks. Proud to say I won! 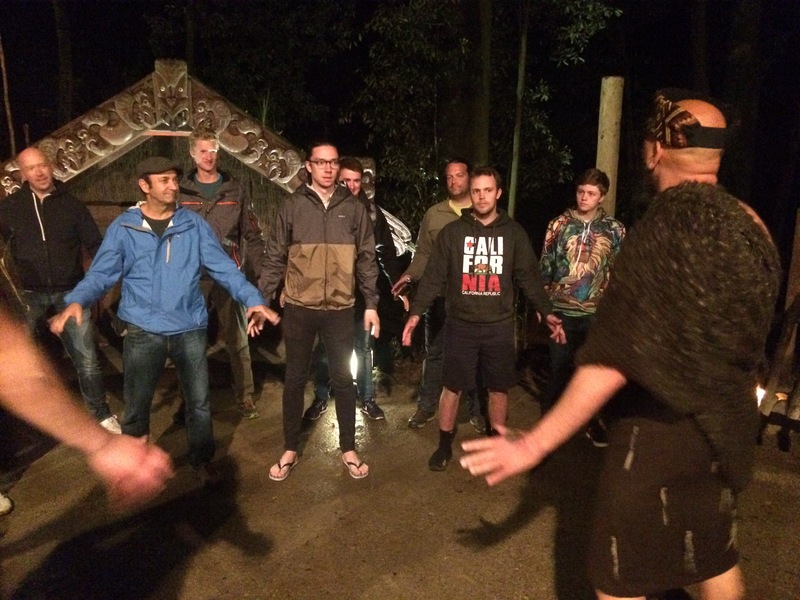 We were then shown to our luxury version of a traditional house (marae) to settle in and have a few drinks before being lead by our chief to the main entrance for the arrival of all the other 100+ guest and formal greeting in the form of a Haka. 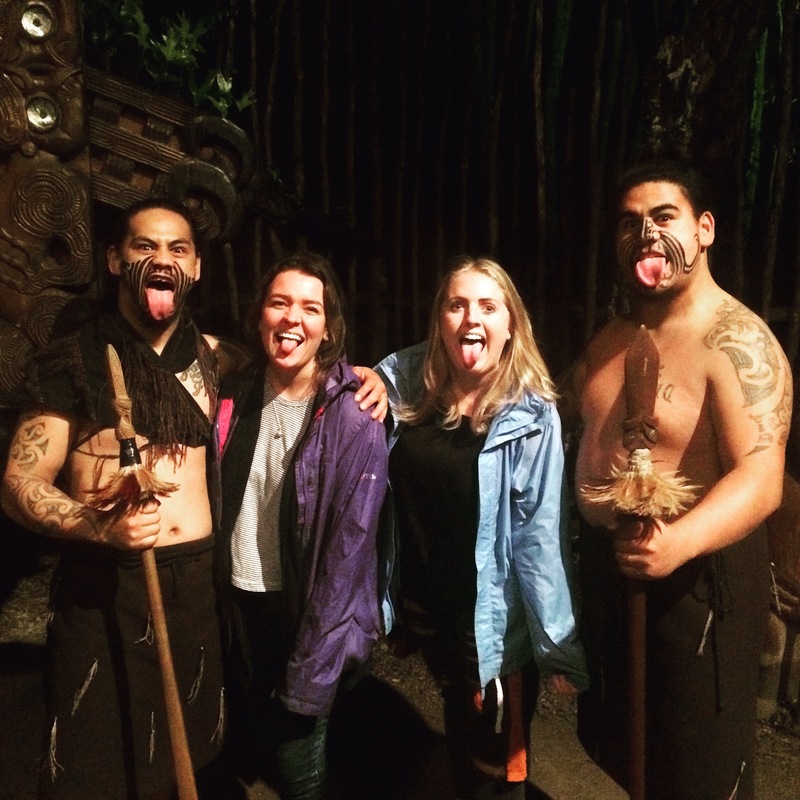 Once we’d been accepted by the Maori tribe, they showed us around the grounds telling us about many of their traditions, such as weaving, training, song and dance. By this point we were starting to get really hungry as they lifted the food from the ground where it was being cooked ready for our dinner (Hangi). Whilst dinner was being set in the main dining hall, we were seated in the theatre for several performances of the traditional song. They were all so talented and it was a great show! One thing that surprised me was how soft the Maori language is. 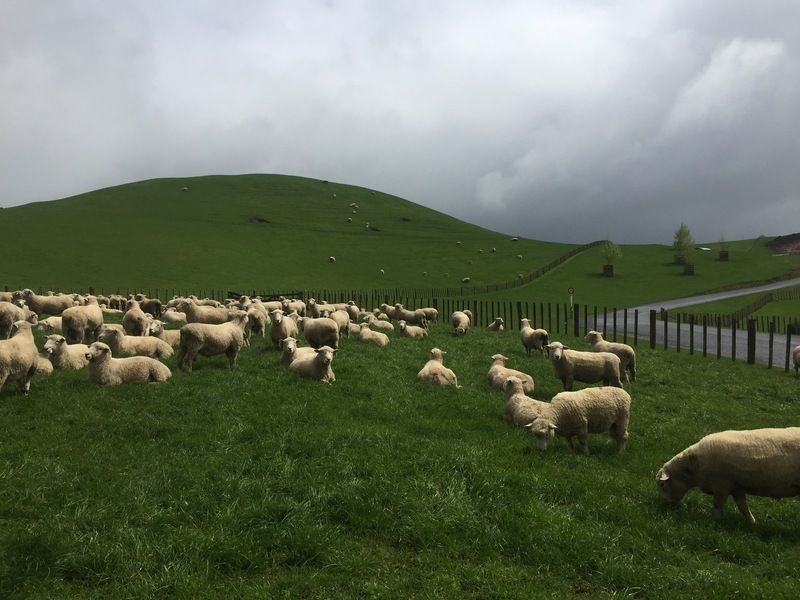 You’re used to hearing it when the All Blacks perform their Haka, but taken in another context, it has a really soft, pretty sound. Finally we were seated and ready for the all-you-can eat roast and it was so delicious!! After several portions and desert it was our turn to take the stage in front of the 100+ dinner guests to perform the song and dance we learnt earlier. We made our way through somehow, although can’t say it sounded amazing! 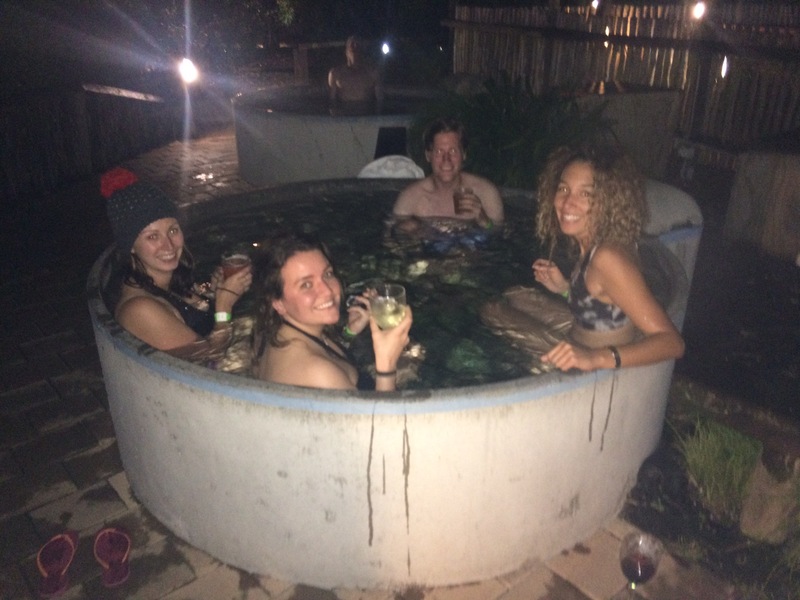 After the rest of the evening guests left, the group of us staying overnight took to the hot tubs with a bottle of wine before collapsing in bed. In the morning, after a great sleep in our lovely room, we had a quick continental breakfast before loading back on to the bus to head to Taupo. 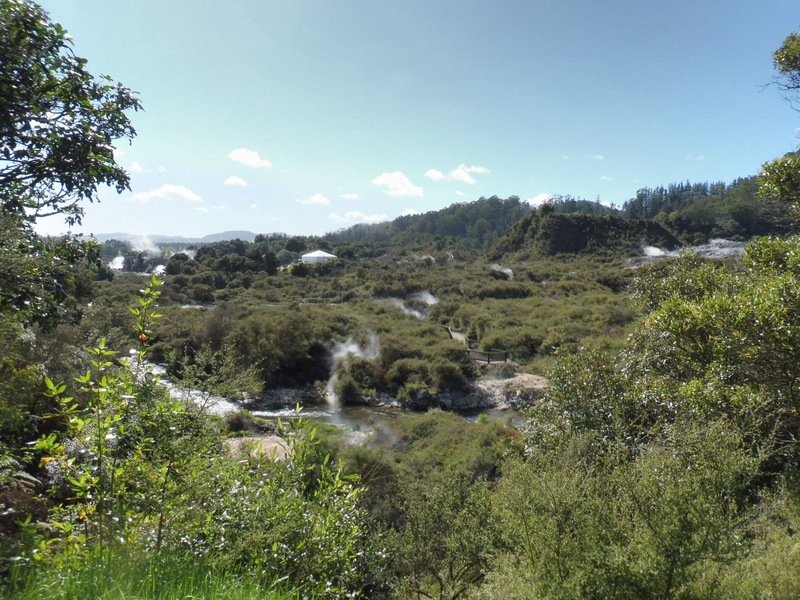 On the way we managed to stop at Te Puia for a tour of the geothermal park. 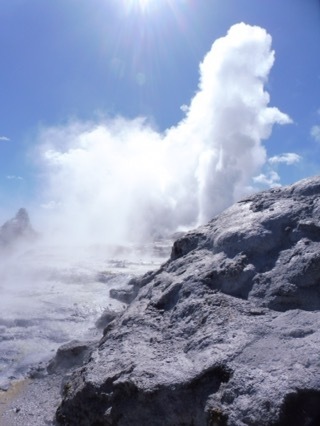 The science behind this is crazy and so surreal watching water and mud boiling from the ground. 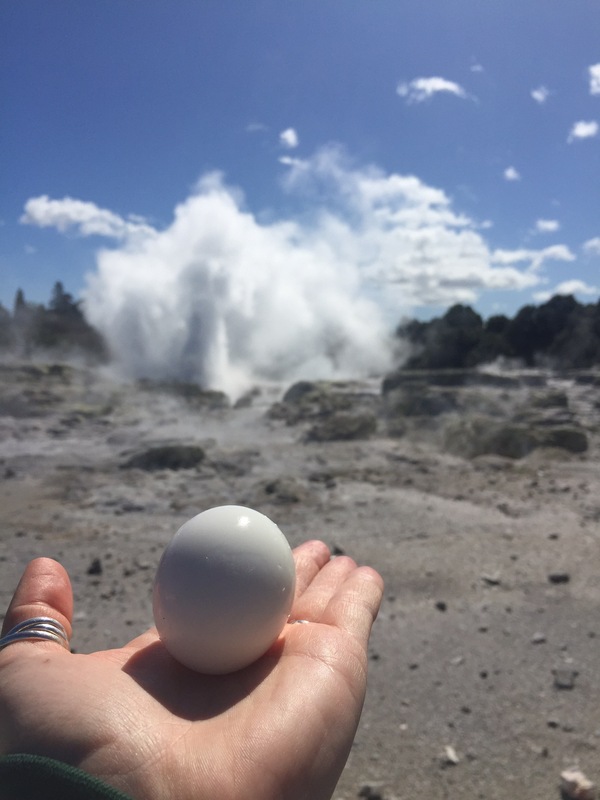 We were also lucky enough to see a Geyser explode, while we nibbled on eggs that had been cooked in one of the hot water pools. 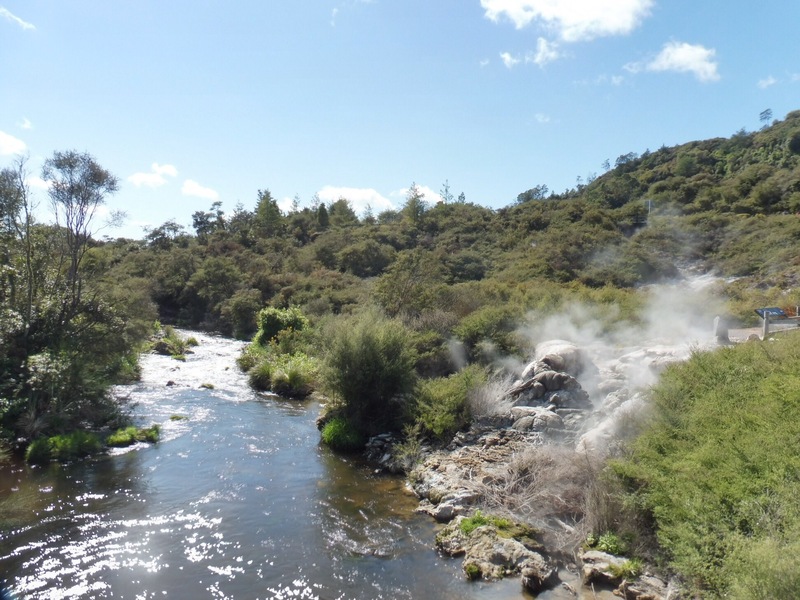 Before coming to Rotorua everyone warns you of the strong sulphur smell. 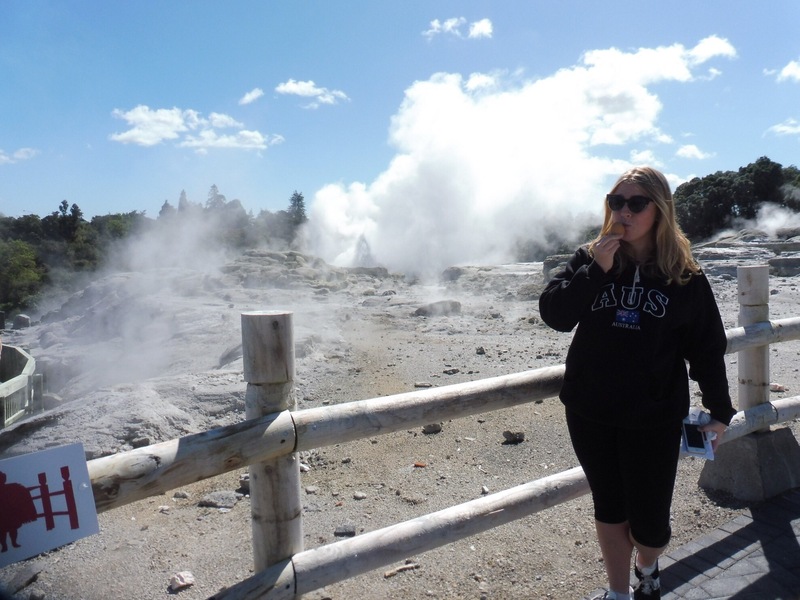 It wasn’t the most pleasant, but not too overwhelming and didn’t put us off admiring the Geysers for a couple hours. *the day after I started to notice red marks all over my body and realised that I’d been badly attacked by bed bugs in the village. Such a shame as it was a perfect night other than that. I let them know so hopefully they’ll be able to sort it. For the meantime I just look very red and spotty and am constantly applying itch relief cream! Sounds like a great adventure – nice tongue! Looks amazing! I really like the quaint dormitory, not the bed bugs though!! Looks like an amazing trip. We have got the lord of the rings triology on DVD which we haven’t watched either! Xmas film instead of Elf this year? ?